When Whistle-binkie was being put together from the pens of Carrick, Rodger, Motherwell, and others in David Robertson’s back shop near the foot of Glassford Street, another howf of men of literary and artistic taste existed not far away. The stationery warehouse of James Lumsden & Son in Queen Street saw the comings and goings of artists like Horatio MacCulloch and Daniel Macnee, and of poets like Andrew Park and Dugald Moore. James Lumsden, first of the name to be Lord Provost, was a warm friend of struggling talent. MacCulloch and Macnee found early employment with him in the tinting of illustrations, and it was by his help that Moore was enabled to publish his first book of poetry. Dugald Moore was the son of James Moore, a private soldier, who appears to have been related to Dr. John Moore, the author of Zeluco, and his more famous son, the hero of Corunna. The poet was born in Stockwell Street, 12th August, 1805. His father, who had married at nineteen, died young; but his mother, Margaret Lamont, of Highland descent, was a woman of character, and managed to give her two sons at least the rudiments of education. It has been said that Dugald was apprenticed to a tobacco manufacturer, but the family account runs that it was to a maker of combs. Comb-making was not to his taste, and the method he took to have his indentures cancelled was ingenious enough. He never made a comb without breaking one or two of the teeth, till his master told his mother she had better send him to some other trade where good eyesight was not required. When at last he obtained a place in the copperplate printing department of Messrs. Lumsden & Son he found himself in a congenial atmosphere. By Lumsden’s help, as already stated, Moore was enabled to publish The African and other Poems in 1829. The book ran to a second edition in 1830, and was followed in rapid succession by Scenes from the Flood, the Tenth Plague and other Poems, The Bridal Night and other Poems, The Bard of the North: a Series of Poetical Tales illustrative of Highland Scenery and Character, The Hour of Retribution and other Poems, and The Devoted One. The poet contributed many pieces, besides, to the Glasgow Free Press, the Western Literary Journal, and other periodicals. On the proceeds of his earlier volumes he was able to start in business for himself as a bookseller and librarian in Queen Street, and when he was cut off, after three days’ illness, at the age of thirty-six, he left a small competence for his mother. In the manner of his end he was a martyr to a mistake of surgery. It was the day of constant venesection, and the poet, laid aside by a slight inflammation, was literally bled to death by his doctor. He died 2nd January, 1841. Moore was a Freemason and was never married, but the portrait of a lady to whom he was attached is preserved, with that of himself by Sir Daniel Macnee, and a quantity of his MSS., by his niece, Mrs. David Smith, Glasgow. The portrait shows him to have borne a considerable personal resemblance to Robert Burns. 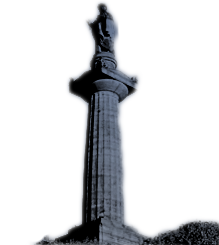 His early death, after accomplishing so much promising work, excited widely-felt sympathy, and he was lamented by a large circle of friends and admirers who erected to his memory in Glasgow Necropolis [Omega 32] one of the most notable monuments in that city of the dead. In his own day Moore’s worth as a poet was widely acknowledged, but his merit has received no more than scant justice since his death. It is true that his muse had little turn for the tender and domestic. His arena was rather that of mountain, moor, and tempest. But his poetry is full of noble and fine suggestion, and in description of nature wild and free, and its association with human passion of the past, he has many passages and whole poems which must rank among the best. His finest work is contained in The Bard of the North.